Dangerous dog breeds - myth or prejudice? Dangerous dog breeds - myth or prejudice? Years ago we went into the woods to let our former English Bull Terrier “Fancy” just run and have fun, because in these woods hardly ever any people used to be around. Yet, on that day there was a biker. As soon as he spotted Fancy – who did not even notice him, she was busy taking a bath in a puddle, ON LEASH – he stopped and started yelling the worst things at us. He ordered us to remove our dog from the woods immediately and threatened if he’d ever see us there again, he’d kill our dog. It’s hard to describe all the feelings and thoughts that went through my heart and head at the same time facing that extend of prejudice. Our dog had passed a character test and had never ever in her life harmed anyone. It can be hard to stay calm watching some people being so scared and full of prejudice that they are just going completely out of line. 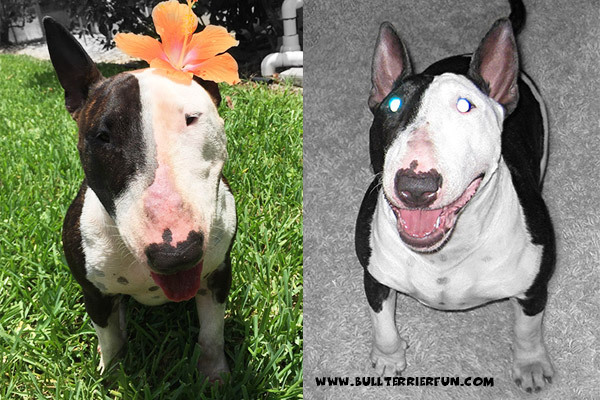 Especially hard for someone who knows, what a people friendly breed English Bull Terriers are. And I guess other owners of other “dangerous dog breeds” would state exactly the same. In Germany – just as in the U.S. – the English Bull Terrier is indexed on a list of so-called “dangerous dog breeds”. But unlike dealt with in other countries in the U.S. – at least in Florida – a dog only gets a record – together with the owner – once there were incidents. I read that this regulation is applied in some of Germany’s provinces too. Sadly today in Germany it is just no longer allowed to import this breed in general. Breeding and ownership are heavily restricted. The regulation bar is set so high that it is hard to meet for a reason. Clearly that all of this is intended to discourage people from owning the dangerous breeds, including the English Bull Terrier. Accompanying “side effects” make it even worse. Some landlords do not rent to owners with listed dogs, insurances refuse liability or home insurance. The Bull Terrier had been kind of a trendy breed for some years in Germany and popular especially among people who buy muscular dogs for the same reasons they buy expensive watches and cars. After quite number of media reports about horrible bite incidents had caused a “dangerous dog breed hysteria” among society and stereotyping the dogs by associating them with a certain social millieu, legislative authorities felt urged to regulate the matter. The history of the Bull Terriers and other breeds that had already been used and bred in the past especially for dog fights by people with no heart for animals did the rest. Culminating in the term “Kampfhund” (fighting dog) in Germany, the equivalent to the term “dangerous dog” in the U.S, for example. The term alone sounds menacing and intimidating. Who wonders that people are alienated by dogs being categorized like this. As the case so many times also in this case the laws and regulations in Germany were nothing more than a helpless attempt to calm the masses, without any real motivation to address the core issue in any way. In many areas literally a racist solutions were established, clearly aiming to make ownership of the unwanted breeds so unattractive that they would disappear sooner or later. My term for that is “premeditated EXTINCTION”. What’s the real issue, you ask? Well, there’s a saying in Germany: “Every dog has teeth, but for proper training still the other end on a leash is responsible”. Read more about myth or prejudice of dangerous dog breeds on the next page. This entry was posted in Character, History and tagged Breed Information, Bull Terrier, dangerous dog breed, dog laws & regulations, Dog Training, English Bull Terrier. Bookmark the permalink.